Morning during Epiphany and the following week. Also on August 7th, De nomine Jesu. Translation by Rev. John Mason Neale, Jesu! The Very Thought Is Sweet! Music: "Melody from the Salisbury Hymnal." Source: Rev. John Mason Neale and Rev. Thomas Helmore, eds., Hymnal Noted, Part I. (London: Novello & Co., 1852), Part II (London: Novello & Co., 1856), #18, pp. 44-45. Sheet Music to Tunes 1 and 2 from Rev. John Mason Neale and Rev. Thomas Helmore, eds., Hymnal Noted, Part I. (London: Novello & Co., 1852), Part II (London: Novello & Co., 1856), #18, pp. 44-45. Sheet Music from Thomas Helmore, Accompanying Harmonies to the Hymnal Noted. 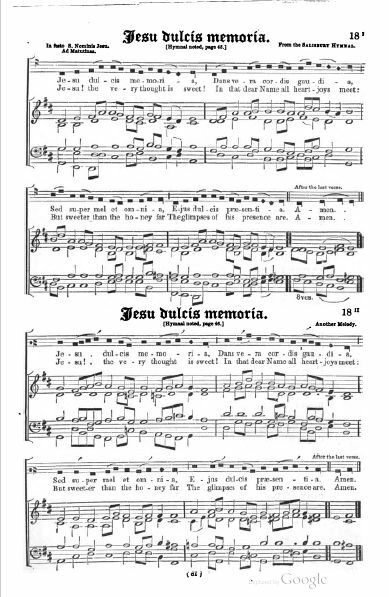 Part I (London: Novello, Ewer and Co., and Masters and Son, 1852), Part II (London: Novello and Co., Joseph Masters and J. T. Hayes, 1858), #18, Jesu dulcis memoria, pp. 80-81. Sheet Music from J. H. Hopkins, ed., Great Hymns of the Church Compiled by the Late Right Reverend John Freeman Young (New York: James Pott & Company, 1887), #88, p. 136. 1. "Jesus! how sweet is the very thought! giving true joys of heart; but surpassing honey and all sweetness is His sweet presence." Supply est in lines 1 and 4. The Holy Name has Jesu in all the cases except the nom. and acc. 2. "Nothing more sweet can be sung, nothing more pleasant can be heard, nothing more lovely can be thought of, than Jesus, the Son of God." 3. "O Jesus, the hope of penitents, how kind art Thou to those who pray! How good to those who seek Thee! But what to those who find!" This question is answered in the following stanza. 4. "No tongue can tell, nor can written word express it: only one who knows from experience can say what it means to love Jesus." 5. "Mayest Thou, O Jesus, be our joy, as Thou wilt be our reward: in Thee be our glory forever." 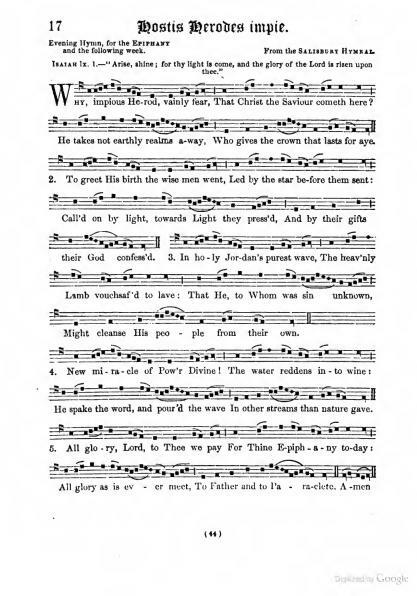 There is a very extensive note in John Julian, Dictionary of Hymnology (1892), pp. 585-589. A few excerpts from that work follow. The most probable moment of his life would then be about 1150, when he was residing in retirement and was weary with the world. Dr. Schaff in his Christ in Song justly styles the hymn as "the sweetest and most evangelical... hymn of the Middle Ages." It is the finest and most characteristic specimen of St. Bernard's "subjective loveliness," and in its honied sweetness vindicates his title of Doctor mellifluus. It is best known as the Joyful (or Jubilee) Rhythm of St. Bernard on the Name of Jesus; but sometimes by the title of In commemorationem dominicæ passionis. The title Cursus de æterna sapientia was probably suggested by Ecclesiasticus xxiv, especially vv. 20, 21. The earliest form of the text now known (and it may be added the best, and most probably the original) is contained in a manuscript of the end of the 12th century, now in the Bodleian, Oxford Laud Misc. 668 f. 101), in 42 stanzas of 4 lines. Dr. Julian noted that it is also found in other manuscripts in England and Europe in the 13th-15th centuries. 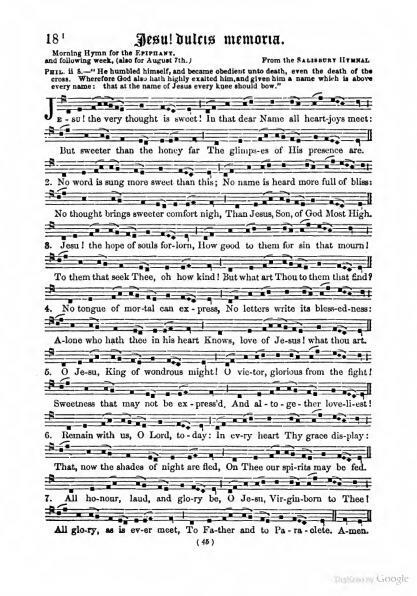 A common form of the hymn is in 48 stanzas of 4 lines and as many as 51 stanzas of 4 lines. He notes "The variations of text are exceedingly numerous and very bewildering. The manuscripts, moreover, not only disagree as to the order of the stanzas, but often as to the order of lines (and of words) in the individual stanzas." He also observed that not all stanzas may have been written by St. Bernard. 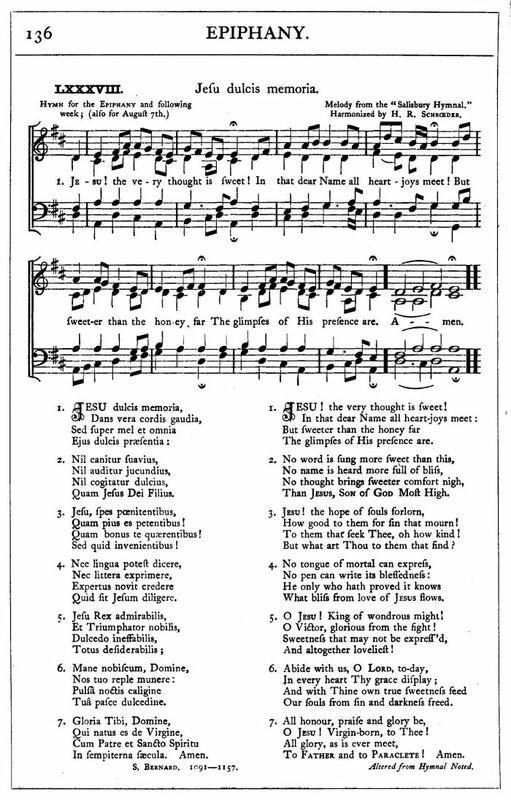 Printed forms of the hymn can be found in many resources including Daniel (48 stanzas), Mone (24 stanzas and a doxology), and Wackernagel (50 stanzas), among others. Several sources also give centos. Dr. Julian recommends one particular source: "The Laud MS. affords a much better text than that which Daniel gives, and it is hoped will not escape the notice of future editors of Latin hymns." Because of its length, it is not found in its full form in the Church's ritual use. Some forms are apportioned to the canonical hours of the day, while others are given as prayers. One form of 50 stanzas is given as a rosary. In about 1500, an Office for the Holy Name of Jesus came into general use that included centos from the poem. A copy of this Office was added to the Sarum Breviary about 1495 and the Paris Breviary edition of 1499, and other English breviaries in the early years of the 16th century. The hymn doesn't appear in the Roman Breviary until 1568. An Office for the Holy Name was authorized for the Franciscians by Clement VII in the 16th century, but wasn't authorized for use until the early 18th century. It appeared as three centos, (1) "Jesu dulcis memoria," for Vespers; (2) "Jesu, Rex admirabilis," for Matins; and (3) "Jesu decus angelicum," for Lauds. There are numerous common translations of these three centos. A partial translation for the Roman Breviary was made by Fr. E. Caswall, followed by a full translation in his Masque of Mary, 1858, and in his Hymns & Poems, 1873, p. 139. 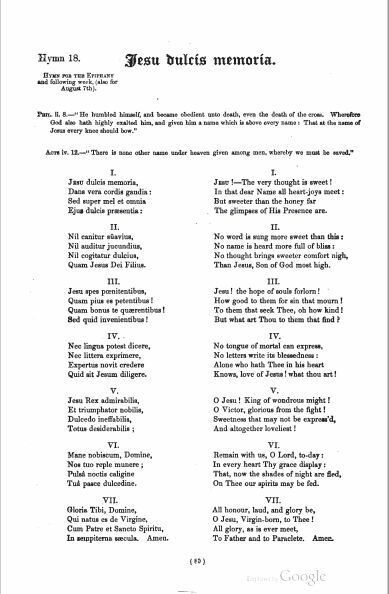 Other full and partial translations have also been made, some of which are quite good, but have been unfortunately overlooked, notably J. M. Horst's Paradise of the Christian Soul and Dr. Edersheim's The Jubilee Rhythm of St. Bernard of Clairvaux. Both of these works can be found at Google Books and the Internet Archive, and at other locations on the World Wide Web. There are numerous translations of the centos found in the Sarum use, the Roman Breviary and the Paris use. In addition, the Latin poem was translated into German, and some of those German translations were then translated into English.